Ever wonder what your favorite Science Fiction authors sound like? We can help. Here’s a complete list of the Science Fiction Writers Of America GrandMasters sorted by the year of their induction and the online audioclips and interviews that we know about. PLEASE NOTE: File types vary ( .mp3 .m3u .ram .wav ). 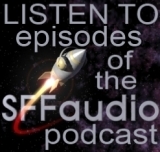 Do you know of some other online audio interviews or sound clips featuring the SFWA GrandMasters? Let us know!